User Scenario 1: Imagine that you just started a new job and you're in need of a new dress. You're looking for something that looks good, but still work appropriate - must be below the knee, no shoulders showing, and not too low cut. You type in 'work dresses on ebay' into Google and are taken to a Google results page. eBay is one of the first search results you see. User Scenario 2: Imagine that you have a holiday party coming up. 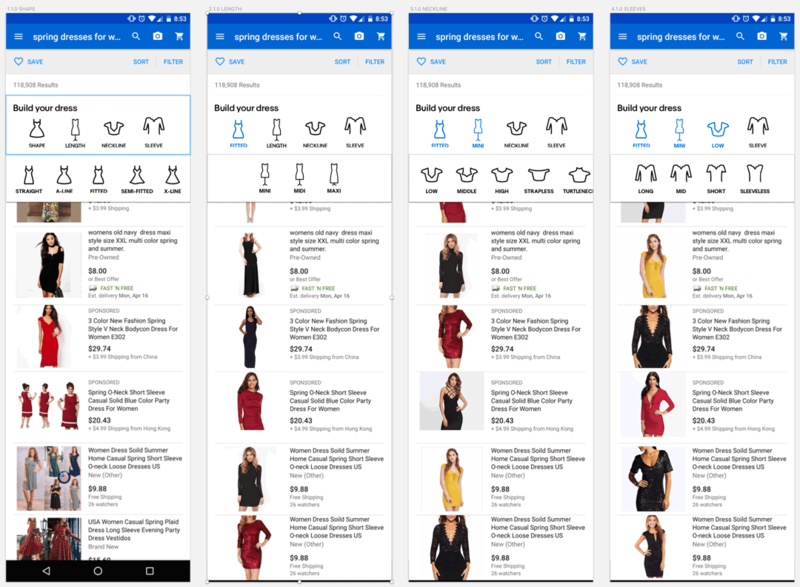 After shopping at some stores, you eventually look online to websites like: Nordstrom, Macy's, Bloomingdale's and filter different types of dress characteristics (i.e., fitted, mini, low-neckline, short sleeve). Let's go to eBay and search for your dress. Finding the right words to describe a specific product is guesswork – every feature can be represented by a variety of words. This means that users don’t have to actually know exactly what they want, and try to put it into words, but can rather choose from a number of options. 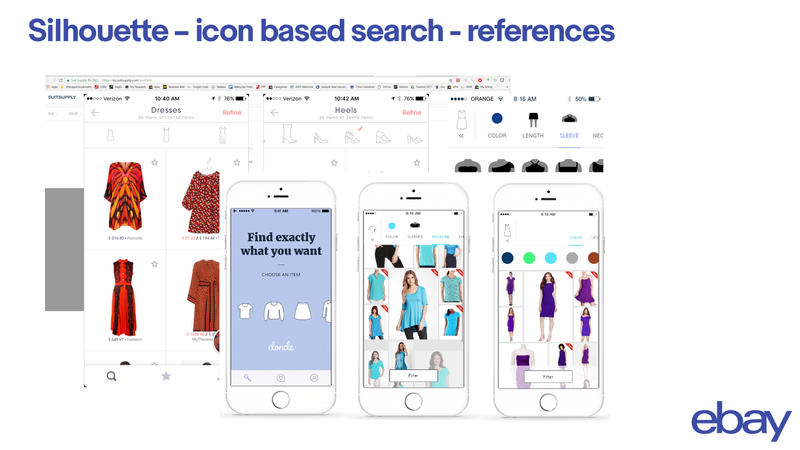 User Problem: Many fashion shoppers do not know specific terminology or are able define (in words) what they are looking for. Silhouettes is a project that explores a new, visual way of filtering across different pages on ebay. 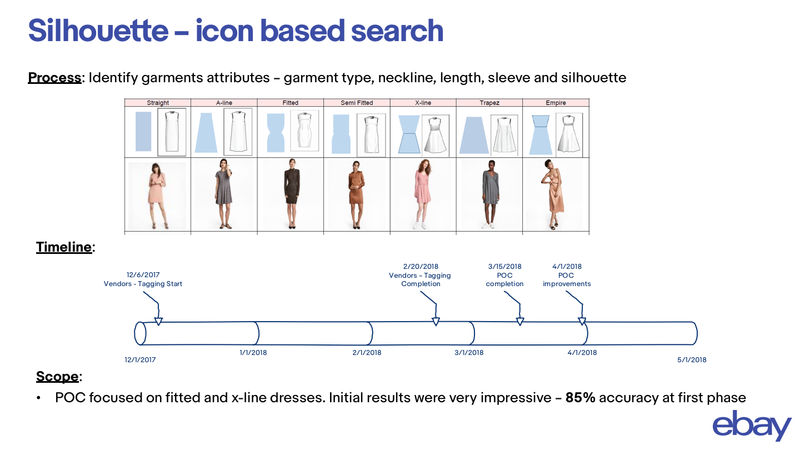 The project intends to make shopping for dresses more engaging by allowing users to visually see the options available and filter down to their specific needs more efficiently. Are they easier or more difficult to do than the existing filtering options (both through keyword search and left hand navigation when possible)? Does it better define/recognize/understand what the user is looking for? Does this form of filtering/browsing feel natural/intuitive? Does it make the shopping experience easier/more engaging compared to the existing experience? Does the experience help to reach relevant results quicker? 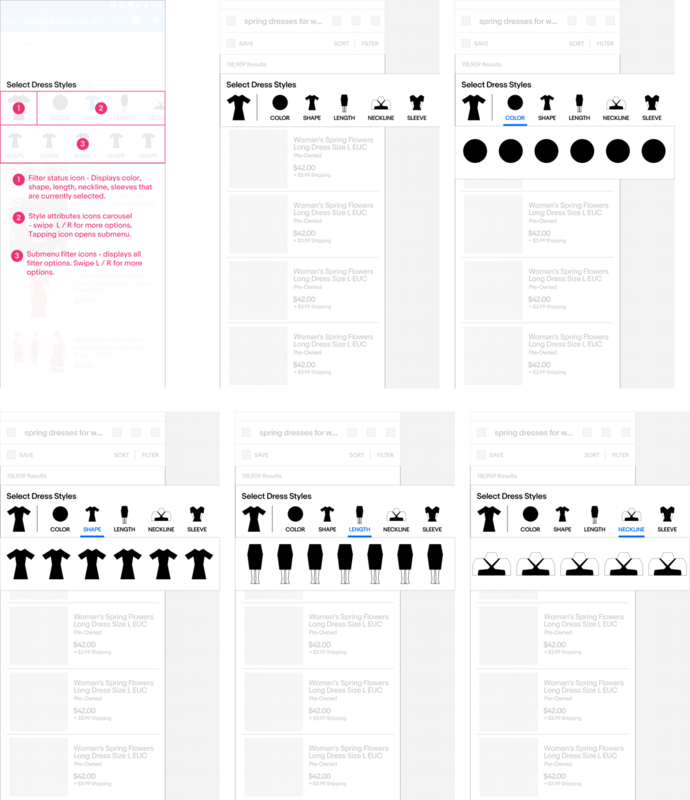 The first draft of wireframes are simple and low-fi, with minimal usage of color. This visually communicates the concepts vet on the whiteboard, bringing the idea into a actionable form. I like to meet frequently with the team, for a quick review so we can identify any issues early on. I will iterate on the wireframes based on feedback, again insuring our team is aligned and comfortable with the design direction. Early round of wireframes to illustrate ideas and vet explorations. 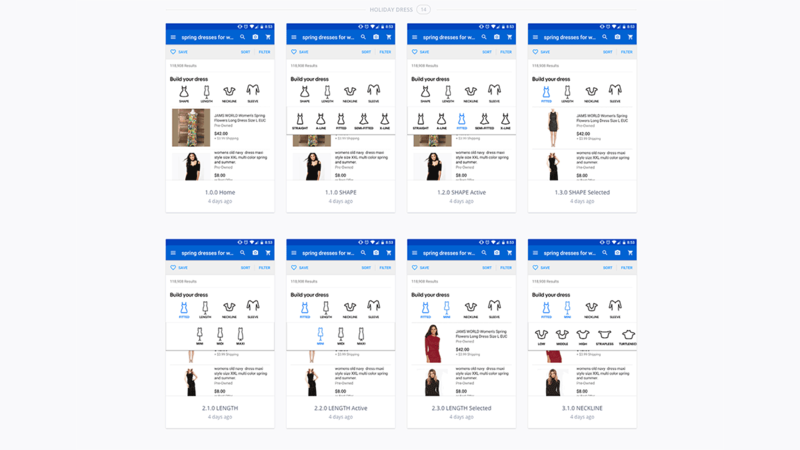 Based on stakeholder feedback, the wireframes go through several rounds of iterations, refining the concept, and increasing the fidelity to where we feel it is in a place that clearly communicates to the user. Preparing the prototype in InVision. The user experience research (UER) sessions are underway as this writing (May 2018), and we will have the initial feedback in the coming week. Our user researcher says that the initial feedback is positive and users like the idea. When the research is done, we will refine the proof-of-concept, increasing fidelity, with the possibility of creating an HTML prototype for more qualitative research. Here you can check out the InVision Prototype.